Introducing Emily M. Randolph's newest collection made exclusively for outdoor use. 'ICE' sculptures are created with lustrous DiBond metal, high-quality UV inks, non-toxic resin and colored fire glass, resulting in a glittering and unusual display, taking outdoor sculptures to a whole new level. Each sculpture represents rebirth and the energizing feel of water. Inspired by the architectural beauty of Arizona's low desert cacti and succulents. Mixed-media, indoor/outdoor 'DESERT ICE' sculpture featuring the majestic, Queen Victoria cactus. The glass and resin give it a glittering effect that will radiate from the sun's rays and change with the light. Mixed-media, indoor/outdoor 'DESERT ICE' sculpture featuring the beautiful agave. The glass and resin give it a glittering effect that will radiate from the sun's rays and change with the light. Mixed-media, indoor/outdoor 'DESERT ICE' sculpture featuring the beautiful agave in topaz, titanium and black glass. The glass and resin give it a glittering effect that will radiate from the sun's rays and change with the light. Mixed-media, indoor/outdoor 'DESERT ICE' sculpture featuring the beautiful agave using large fireglass accents of green, gold and icy mint. The glass and resin give it a glittering effect that will radiate from the sun's rays and change with the light. Mixed-media, indoor/outdoor 'DESERT ICE' sculpture featuring the beautiful agave in jade green, titanium and gold reflective glass. The glass and resin give it a glittering effect that will radiate from the sun's rays and change with the light. 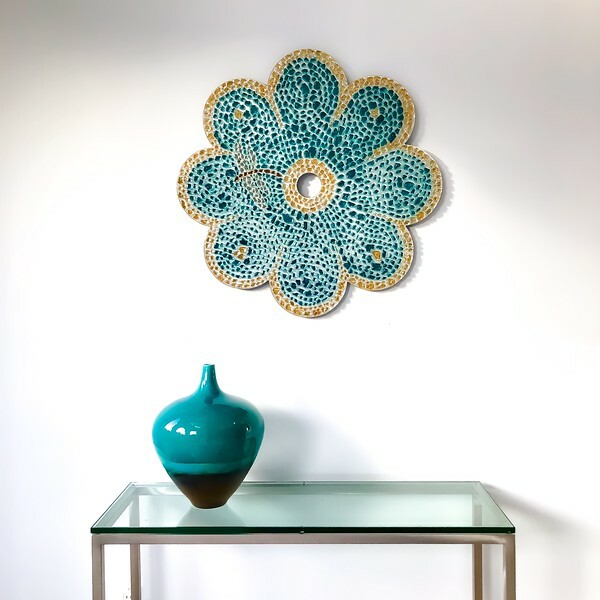 Mixed-media, indoor/outdoor 'DESERT ICE' sculpture featuring the beautiful agave in Pacific blue, emerald green and gold reflective glass. The glass and resin give it a glittering effect that will radiate from the sun's rays and change with the light. Inspired by the zen-like vibe of the high desert, featuring the mystical lotus flower. Mixed-media, indoor/outdoor 'ZEN ICE' sculpture featuring the mystical lotus flower from a bird's eye view. The glass and resin give it a glittering effect that will radiate from the sun's rays and change with the light. The lotus grows out of mirky waters and emerges as one of the great beauties of this world. 'Double Open Lotus' in the 'ZEN ICE' indoor/outdoor collection, sparkles as if covered in drops of water and is a two layer piece with the center raised an inch above the background petals. Reflective glass of gold, emerald and aqua blue are covered in glossy resin. Jewel Lotus; 18": SOLD. Available by Commission. Mixed-media, indoor/outdoor 'ZEN ICE' sculpture featuring the mystical lotus flower from a side eye view. The glass and resin give it a glittering effect that will radiate from the sun's rays and change with the light. Mixed-media, indoor/outdoor 'ZEN ICE' sculpture featuring the mystical lotus flower. The reflective glass of gold, titanium and leaf, as well as the resin, give it a glittering effect that will radiate from the sun's rays and change with the light. 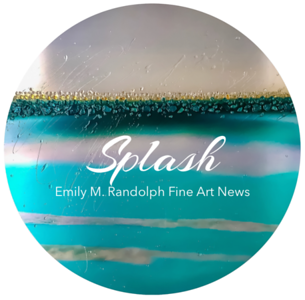 Inspired by Emily's love of water, featuring water drops and waves. Mixed-media, indoor/outdoor 'LIQUID ICE' sculpture of sparkling Pacific coast currents. The reflective glass of sapphire, aqua and copper, as well as the hand-poured resin, give it a glittering effect that will radiate from the sun's rays and change with the light. Making Waves; 32 x 24 SOLD. Available by Commission. Here's to breaking away, doing your own thing, body, soul and spirit as expressed in the three breaking waves. Like water, you are a powerful force and can overcome any challenge. 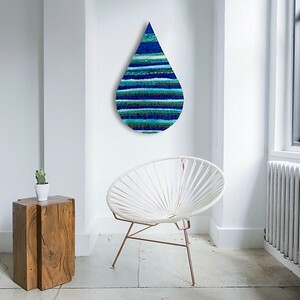 'Making Waves' is mixed media on aluminum with titanium and Pacific blue reflective glass and glossy, water-like resin. Indoor/outdoor. Live boldly as you play on pink sandy shores, the waves splashing over you. This is 'Coral Shores,' LIQUID ICE, mixed-media outdoor/indoor art with titanium, gold and sapphire reflective glass covered in glossy resin. Indoor/outdoor. It's only natural that Emily's water-centric art can be used IN water. 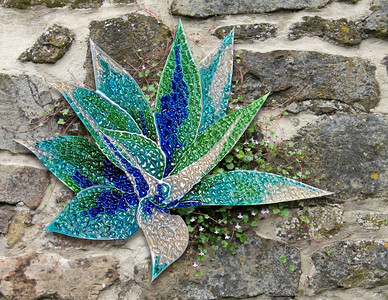 Emily's outdoor wall sculptures can also be custom made as water features. See video below. Each piece has an aluminum cleat system in the back for easy hanging on any sturdy surface. The sculptures are well-suited for outdoor use. The resin is certified non-yellowing, non-toxic, and both UV and HALS (Hindered Amine Light Stabilizer) stabilized. The fire glass itself is made for outdoor use and should also weather well.